South Korea’s Hyundai Industries which is known more for its ship building and heavy engineering is also making a big push into the Green Energy Space. Like its South Korean peers, Hyundai is also preferring to enter this space through Solar Energy. Hyundai has already established a 600 MW Solar Cell and Solar Panel Factory making it the largest South Korean manufacturer. Hyundai had earlier bought solar cell equipment from Germany’s Centrotherm as far back as 2008 and had entered a long term contract with LDK Solar for buying solar wafers as raw material for its cell lines. Note Hyundai Heavy has also heavily invested in the Wind Turbine Industry. Hyundai Heavy has started producing 2.5 MW Turbines from a 500 MW Plant in Geoje Island in South Korea. Hyundai Heavy is amongst the many South Korean Chaebols making a big push into Solar Energy like LG and Hanwha. Hyundai Heavy is planning production throughout the silicon solar supply chain. Its sister company KCC has started a 6000 ton polysilicon plant in South Korea. It is in negotiations with the Hungarian Government to set up a manufacturing base in that country to serve the European markets. It is also targeting the US market with partnerships with companies like Raser Technology and Matinee Energy. It is also planning to set up a 240 MW solar power plant in partnership with Matinee Energy and LG. Hyundai sells Solar Panels under the following Series of Panels which differ in the number of solar cells being used. 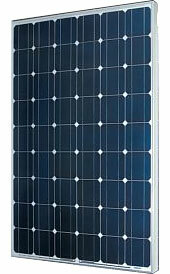 2) MF-Series of Solar Panels The MF Series of Solar Panels come in the 203-225 Watts Power Rating and come in both multi and monocrystalline versions. These Solar Panels have 54 Solar Cells and use 6 inch mono and multi cells. The Efficiency of these Solar Panels varies from 14-15.5% which is just about average for normal silicon solar panels and low for monocrystalline silicon solar panels. Buy Hyundai Polycrystalline Solar Panels here. 3) MG-Series of Solar Panels The MG Series of Solar Panels come in the 228-250 Watts Power Rating and come in both multi and monocrystalline versions. These Solar Panels have 60 Solar Cells and use 6 inch mono and multi cells. The Efficiency of these Solar Panels varies from 14-15.5% which is just about average for normal silicon solar panels and low for monocrystalline silicon solar panels. Buy Hyundai Monocrystalline Solar Panels here. Hyundai Sells Solar Inverters as well. It ranges between 100 kw to 1 MW Solar Inverters and come in both 1 phase and 3 phases. Hyundair Solar Panel Prices Hyundai Solar Panels are not widely available and they don’t have a big difference from other solar panel brands. They seem priced high, at $2.5/watt in some places though I think in bulk orders you can get solar panels at much lower prices given that you can buy the cheapest solar panel from China at only $1/watt and even quality Japanese and European solar panels for $1.8-2/watt. Hyundai Solar Panel Dimensions, Certifications and Warranty – Hyundai Gives a Standard Product Warranty of 5 years and Performance Warranty of 25 years which is the standard warranty given by most solar panel manufacturers in the industry. The dimensions of the Hyudai Solar Panels are 983 mm(W) × 1476 mm(L) × 35 mm(H) for the MF Series and 983 mm(W) × 1645 mm(L) × 35 mm(H) for the MG Series of Solar Panels. Hyundai mostly sells Solar Panels in the above 200 Watt range with 250 Watt Solar Panels being the popular make. Hyundai’s HiS-S250MG monocrystalline solar panels with 19 kgs weight and aluminium frame is the most popular panel. While Hyundai sells solar panels everywhere they are currently being pushed in Australia and UK. Suntech – Suntech was the world’s biggest producer of solar panels in 2010 and was one the first companies to set up operations in China. Its example was followed by a host of other Chinese companies. Suntech has been slow to expand compared to the fast growing small companies in China and has lost marketshare to them. It has started to vertically integrate in order to meet the low cost challenge from Trina and Yingli. Suntech makes one of the best quality Solar Panels in China. Yingli Green Energy – Yingli Green Energy is one of the oldest Chinese companies and is completely integrated from polysilicon. The company has been expanding rapidly and has one of the lowest cost structures in the industry. Yingli Green Energy has been sponsoring Football in Europe and has started a new line of high efficiency “Panda” Solar Panels. Yingli is the second biggest producer of Solar Panels in China. Trina Solar – Trina Solar is one of the lowest cost manufacturers of Solar Panels in the World right now and also sells it at a very low price. This is the reason that the company in a span of few short years has managed to acquire a substantial global marketshare. The prices the solar panels being sold are around $340 per 200 watt module. Like Yingli and Suntech, Trina Solar Panels are one the best quality in China. Hanwha Solar One – The Company which was recently acquired by South Korean Chemicals Giant Hanwha also makes one of the cheapest panels and sells it a very low price. The quality is also quite good and with strong parentage behind it, the solar panels made by the company. Again like Trina Solar,it has very low cost Chinese manufacturing capacity. The company was earlier known as Solarfun. Canadian Solar – The Company sells a wide variety of solar panels unlike other producers. The Solar Panel Selling Price is also quite cheap. The Company is headquartered in Canada with factories in China and Ontario. Canadian Solar is the 5th biggest producer of Solar Panels in China. LDK Solar – This is the biggest producer of solar wafers that are used by crystalline solar panels but is losing its No.1 position to GCL Poly. Is expanding rapidly into other parts of the solar supply chain and could break into top 10 solar panel producer in the next couple of years. LDK Solar is building a huge solar panel and cell production facility.It sells Solar Panels mostly to other Solar Panel Companies. Jinko Solar – Jinko Solar has shown the fastest growth rates in the Chinese Solar Panel Industry. The company is expanding again to become one of the Top 5 Solar Panel Producers in China. Jinko Solar like Trina and Yingli is vertically integrated and has one of the lowest cost solar panel production process. Trony Solar – Trony Solar is the largest Solar Thin Film Producer in China and uses a-Si Technology to producer Solar Panels used mostly in Off-Grid Applications. The company uses its own custom made equipment and manages to get decent margins for its products. The company recently listed on the HK Stock Exchange.